This woman was very recently diagnosed with diabetes. She did have cancer and is now cancer free. I don't have more details about her health, but have contact information so can ask questions. I have close-ups of the palms as well, if there's an interest. I think she is in her late 40's. 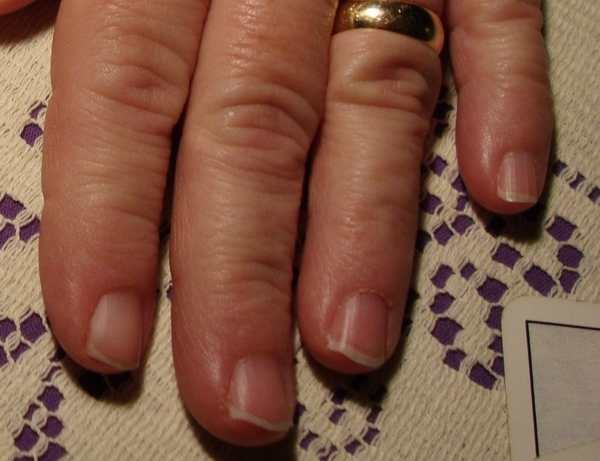 I find particularly interesting her shiny, reddish fingertips and the damaged cuticles around the nails. Nails have strong vertical ridges. Hi Patti, thanks for sharing! Patti wrote: This woman was very recently diagnosed with diabetes. She did have cancer and is now cancer free. I don't have more details about her health, but have contact information so can ask questions. I have close-ups of the palms as well, if there's an interest. I think she is in her late 40's. Another interesting feature which might be related to the cupping of the hands or praying hands position is the distal ring finger knuckles. 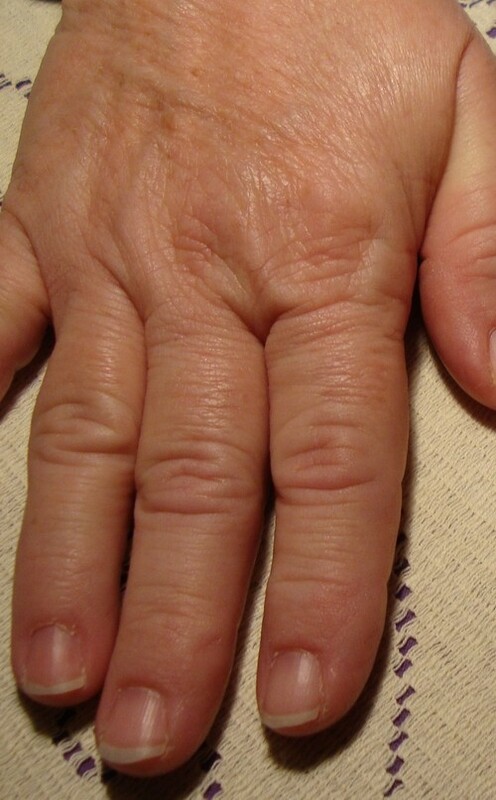 There is a slight bowing to this area of the finger and the knuckle is becoming smooth in comparison to the other fingers distal knuckles. She also isn't laying her hands flat in the space between the index and thumb. Diabetes mellitus is a group of metabolic diseases in which a person has high blood sugar. 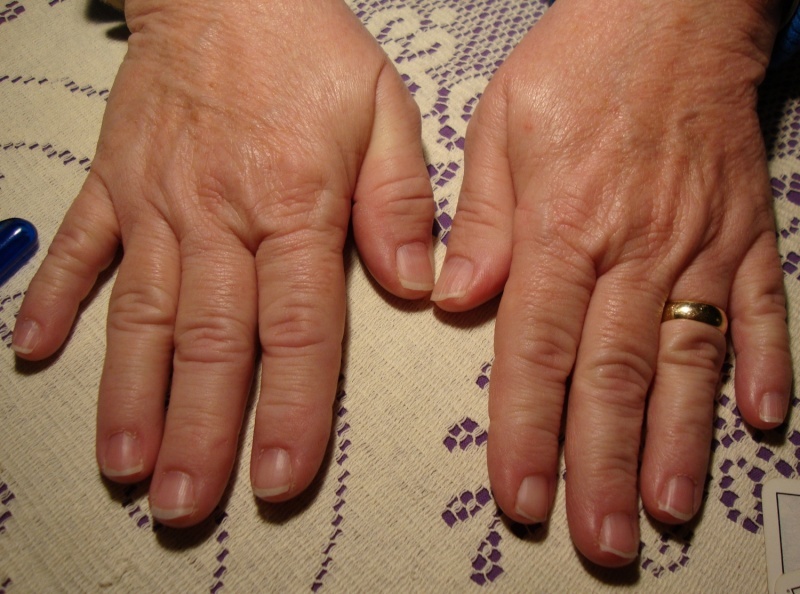 Regarding the hand, scientific studies have pointed out that the so-called 'diabetic stiff-hand syndrome' (a.k.a. diabetic cheiroarthropathy) characterized by stiffness (without the joints directly getting involved) and thickening of skin, is recognized to represent a common complication of both diabetes mellitus type 1 (up to 50%) and type 2 (up to 75%).20 Actually, there is a large group of hand signs that may represent a significant clue for diabetes mellitus type 1 & type 2. This article presents an overview of 35 individual hand signs that are significant for diabetes mellitus (featured with illustrative statistics). 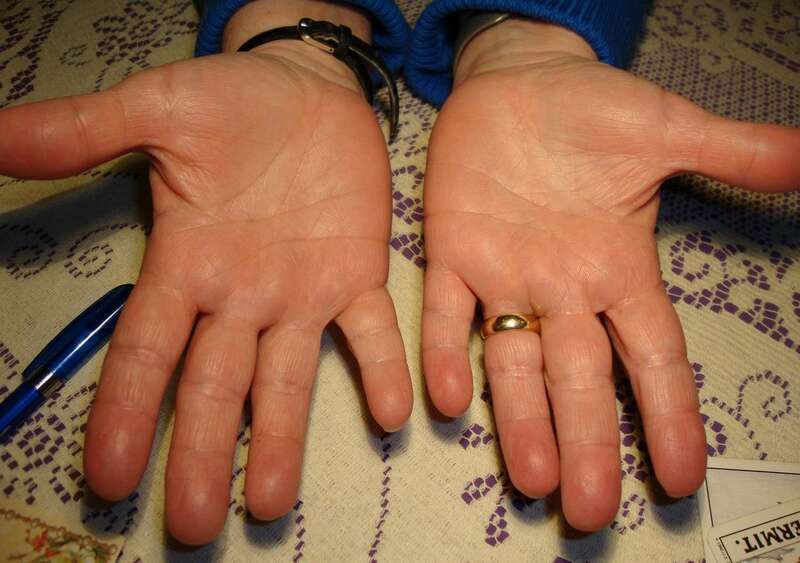 The statistics indicate for both forms (type 1 & type 2) that the development of the disease typically manifests inside the hand with especially abnormalities in the skin (and/or nails) & motoric control; though of much lesser concern, also dermatoglyphics (in the lower palm) & major palmar creases may present significant clues!